In their earliest days, inns were located in rural areas between major cities and usually along frequently traveled roads. They offered a warm and comfortable place for travelers to eat and sleep before enduring another day of rugged travel. While some inns began as personal mansions, others derived from a need for lodging as people began moving out from their original settlements. Here, we’re looking back at some of the most famous American colonial inns that modern travelers can still visit today! In 1773, Silas Pepoon recognized the need for a resting place for stagecoach travelers on the long and bumpy stretch of road between Boston, Massachusetts and Albany, New York. He established a small inn in rural Massachusetts and it quickly became a success. Over the next 100 years, the inn had several owners, but they did little to upgrade the property. That is, until 1873, when the land was bought by Mr. and Mrs. Charles H. Plumb. The Plumbs expanded the inn to accommodate 100 guests, and most of today’s antique furniture and china was added by Mrs. Plumb. The Red Lion Inn continued to grow in size and reputation until August 31, 1896 when a tragic fire swept through the area and destroyed much of the building. Luckily, most of the irreplaceable antiquarian items were saved by Mrs. Plumb. Reconstruction commenced almost immediately and the inn reopened for business in 1897. Presidents and celebrities alike have been known to stay at the Red Lion Inn. Presidents Franklin Roosevelt, Calvin Coolidge, and Grover Cleveland, along with actor John Wayne, writer Nathaniel Hawthorne, and musician Bob Dylan have all been guests of the historic inn. At almost 300 years old, Wayside Inn is among the oldest inns still housing travelers in the United States. It was first founded in 1716, when David How built an extension onto his own residence and named it How’s Inn. He offered it to the people traveling between Boston, Worcester, and New York. David eventually passed the inn along to his son Ezekiel, who passed it along to his son Adam in 1796. 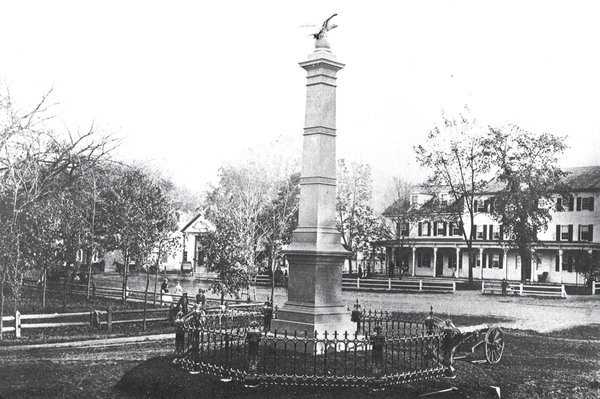 Adam carried on the tradition and handed the property down to his son Lyman in 1830, but Lyman died suddenly in 1861 without having had any children. After his death, relatives inherited the property and closed the inn to the public, opening it only to rent out for dances or longer stays. Wayside Inn found its permanent name when Henry Wadsworth Longfellow made it the meeting place for the fictional characters in his 1863 book, Tales of a Wayside Inn. 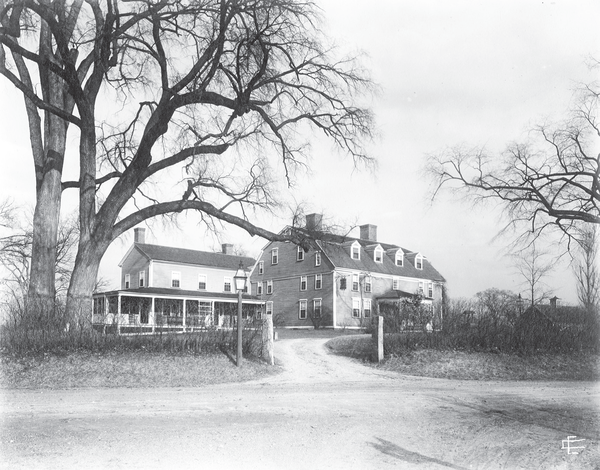 The book stirred the imaginations and curiosities of the public, so when Edward Rivers Lemon, a wealthy antiquarian and wool merchant, bought the property in 1896, he changed the name to Wayside Inn. Lemon reopened it for business, and today it remains one of the few inns from the Colonial Era in Massachusetts still accepting guests. In 1681, William Penn was granted a royal charter from Charles II the establish a stretch of land that is today known as the Main Line of Philadelphia. From 1681 through the early 1700s, the people dwelling on the land were mostly squatters. Construction on the Great Valley House is believed to have begun in the late 1600s by unknown tenants, as the inn contains rare stone sinks that have been dated y experts to 1690. Since the 1800s, the size of the land has shrunk considerably, and there are only four acres that belong to the property. Today, the Great Valley House is a unique blend of old and new - original accessories like stone sinks, wide fireplaces, iron hinges, and uneven wood paneled floors are combined with a modern in-ground swimming pool, free Wi-Fi, and a free home-cooked breakfast. 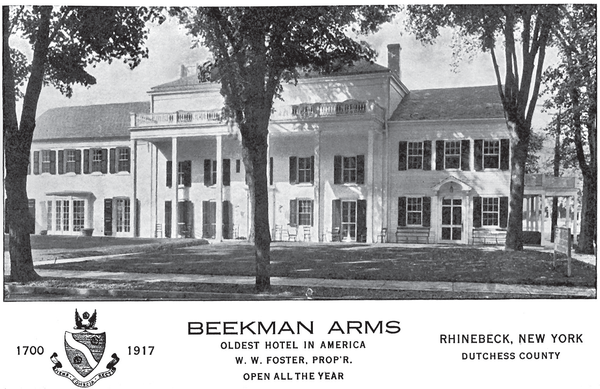 Formerly known as the Traphagen Inn, Beekman Arms was established in 1704 by William Traphagen. It was built in a small forest settlement that had been colonized by the Dutch in the 1680s. The inn’s name was later changed in honor of a Dutch man, William Beekman, who proved crucial to the overall development of the area, serving as Treasurer for the Dutch West India Company and Mayor of New Amsterdam, today known as New York City. During the Revolutionary War, the Fourth Regiment of the Continental Army practiced drills on the inn’s front lawn and George Washington, Alexander Hamilton, and Benedict Arnold were recorded having lodged at the inn for short periods. It also became a refuge for townsfolk when the British army burned the state capital across the river. Since then, the original structure of the inn has remained mostly intact - strong oaks beams still hold the ceiling, and uneven planks line the floors. Today at Beekman Arms Inn, people gather to eat, drink, and converse just as they did back in 1704, and visitors can visit the antique market, dine at the historic 18th century restaurant, or attend one of the many events hosted by the inn. These are just some of the many colonial inns that still welcome guests across the country, offering a unique chance to experience 18th century living and dining with the comfort of modern amenities. Their stories reflect pivotal eras in American history, and provide visitors with a wealth of knowledge. Whether they served as a place of refuge for leaders of the American Revolution, or were built as personal homes, spending a night at a colonial inn should be high on any traveler’s list.